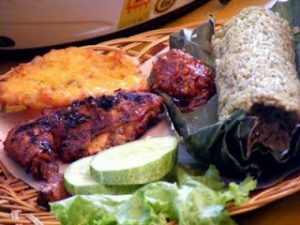 This cuisine is served with cucumbers, Piece of grilled rooster, Perkedel Jagung (salty corn cake with spices), sambel terasi and special grilled rice which is served with banana leaf as its plate. Very delicious and strongly recommended if you come to Bandung!. this cuisine only costs approximately USD 1.5 (including beverage). I usually eat Nasi bakar in the place behind of Gedung sate Bandung. Nasi goreng is the most popular Indonesian cuisine in the world, because every time I traveled to another countries people have already familiar, even in the local restaurant outside Indonesia. 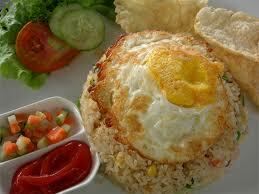 Usually Indonesian people eat nasi goreng for breakfast. However, I think it’s completely weird for western people to eat rice for breakfast because one time I enjoyed nasi goreng for breakfast and my flatmate in Oslo think that I am crazy. 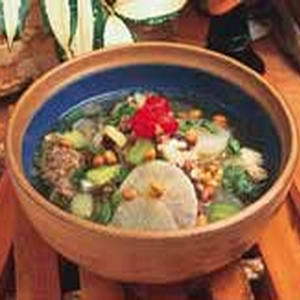 As it’s name, this food is originally from Bandung, Served with beef slices, peanut, horseradish with salty soup. This is very delicious!